The Clemson Tigers fell short of making the Match Play round at the NCAA Finals being played at Karsten Creek in Stillwater, Oklahoma. Clemson started the final round in 12th place, six shots from the cut line to advance to match play. The Tigers were never able to make up the ground needed to keep their season going. Clemson finished in 13th place after shooting a final round 304 total. “This was a tough day for scoring for everyone,” said Clemson coach Larry Penley. “The greens were faster than when we started, but the big thing was the pin placements. They were the most difficult of the week,” he said. Bryson Nimmer started the day with a 2-shot lead in the individual standings, but a difficult start allowed the field to catch and pass the Tiger junior. Nimmer was 4-over par on his first nine holes, but stayed within two shots of the lead until a triple bogey on his 15th hole ended his chances for an individual title. Nimmer finished at 6-over par for the final round and dropped into a tie for seventh place at 3-under par. 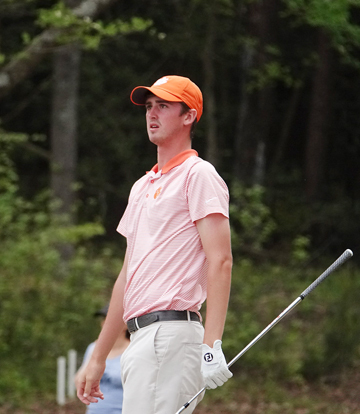 It was the highest finish by a Clemson golfer in an NCAA final since Kyle Stanley was the runner-up in the 2009 championship. The three time All-ACC performer set a Clemson tournament record in the first round when he shot a 8-under par 64 to take the early lead. It was the best score posted by any player in the championship. Freshman Colby Patton had his best round of the tournament and the best round for Clemson on the final day. The Hillcrest High School grad finished at even par 72. The tournament marked the end of Doc Redman’s career at Clemson. The defending US Amateur champion has told his teammates that he intends to turn pro. Redman missed much of the spring season taking advantage of invitations he received after winning the US Amateur. Redman finished in 15th place after shooting a final round 76. After playing in the Masters, the Heritage and the Arnold Palmer Invitational, Redman has an invitation to play in this weeks Memorial Tournament at Jack Nicklaus’ Muirfield Village Golf Club. Clemson finished the season ranked in the top-20 and recorded two tournament wins as well as a second place finish in the ACC tournament. Three Tigers, Doc Redman, Bryson Nimmer and Turk Pettit were named All-ACC. The 13th place finish in the NCAA Finals was the Tigers best since a fifth place finish in 2008. 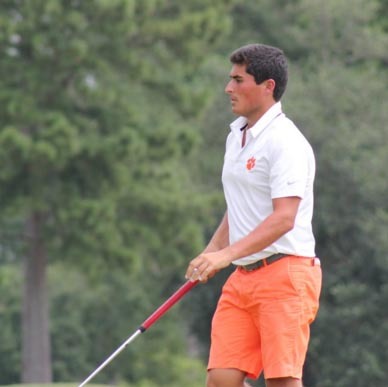 While the Tigers were eliminated from the tournament there will be two Palmetto State golfers advancing with their teams to play in the Match Play tournament. Alabama’s Jonathan Hardee from Greer helped the Crimson Tide make the final eight. Alabama finished in a tie for sixth place. Hardee’s birdie on his final hole gave the Tide a boost into a qualifying spot. Trace Crowe from Easley helped Auburn finish fifth and make the team finals. The home team from Oklahoma State finished on top of the team standings and has the top seed for match play which begins on Tuesday. Broc Everett from Augusta claimed medalist honors with a sudden death victory over Auburn’s Brandon Manchero.